In the early 1930s, it was hard to find a more successful string band than Mississippi Sheiks. Founded by fiddler Lonnie Chatman, the group earned widespread recognition throughout the South for its eclectically groundbreaking displays of folk, pop, and country blues, so much so, that it made forays to New York City and Chicago on the strength of its biggest hits Sittin’ on Top of the World and Stop and Listen Blues #2. The former, of course, was covered by the Grateful Dead (which likely learned it from Bill Monroe) on its self-titled 1967 debut, while the latter undoubtedly served as the loosely-based inspiration for the ensemble’s Caution (Do Not Stop on Tracks), which appeared on Anthem of the Sun. The recently released, 20-song compilation Honey Babe Let the Deal Go Down: The Best of Mississippi Sheiks provides even more fodder for budding music historians of the Grateful Dead as well as other more contemporary artists, simply because of the many elements percolating throughout its dusty strains that elude to tunes that had yet to be written by a myriad of acts. Although the collection focuses entirely upon Mississippi Sheiks’ 1930-31 recordings, most of which were made for the OKeh label, this was a time when the group was at the peak of its abilities. Although Chatman’s brothers Bo and Sam joined the proceedings on occasion, particularly to serve as the accompanists to Texas Alexander — a blues star in his own right — most of the songs were performed as duets between Lonnie Chatman and guitarist/vocalist Walter Vinson, who share a rather special and magical chemistry. 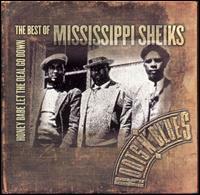 As a result, The Best of Mississippi Sheiks is an intriguing examination of an ensemble that survived for less than a decade but helped shape the future of blues, bluegrass, folk, and rock for a far longer period of time.